The intense heat here in the Panhandle made me do it: head for the indoors. Normally, I am out hiking the canyon trails at Palo Duro. But with daily temps in the 90s, I knew it was time to find alternate adventures. That meant heading indoors to some of the fine museums in Amarillo. Kwahadi Kiva Museum of the American Indian displays the crafts and artwork of many tribes in the southwest: Comanche, Navajo, Apache, Kiowa, Zuni. There is a fine collection of ceremonial dance masks at the Kiva. 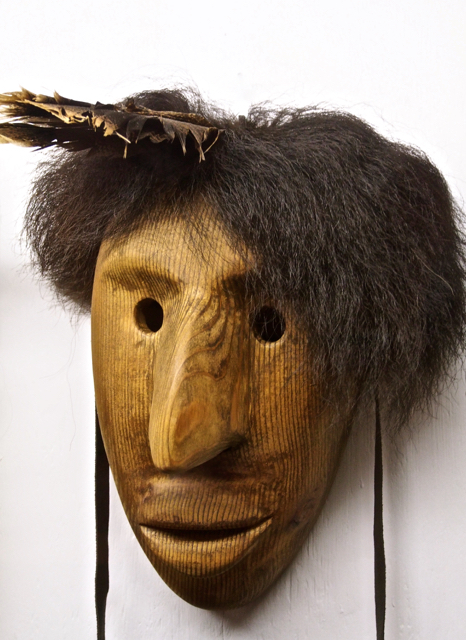 The Booger Mask, carved from cedarwood, is hung in the home facing the front door. Booger Spirit is the protector and guardian of the family and home. That’s the one for me! I want a Booger mask.